I'm working on a post on my birthday goodies. Until then I thought I'd show you this little lady I got for 50 cents at my favourite Goodwill the other week. She has a translucent 'skin',but kind of intense eyes. 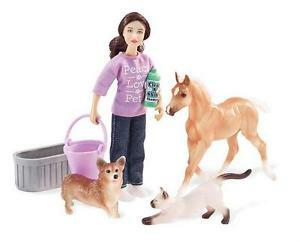 She originally came in a Breyers Classics set 'Pet Groomer',which came with a Corgi dog, Siamese cat, palomino foal, shampoo bottle, bucket and a water trough. She can be used with a small Breyers horse,so she has some good articulation for sitting on the horse. She's described as being 6" tall,but I measured her at 6 1/2" tall. She's slightly tall for my dollhouse, but she has gone to live there for the time being anyway. Her shirt and jeans are nice, but her shoes are really cheap and thin. The toes were caving in and they were moving around and sitting on her feet at weird angles. I might just steal her clothes for a doll I already have and redonate her. I kind of like her though.